By 1916, the 32 year-old pianist has run his own little orquesta for 3 years in Buenos Aires and is ready to unveil his ideas about what a tango orquesta should sound like and how the instruments should be arranged. The usual combo making the music: guitar, violin, flute, clarinet, etc., bass (sometimes there had been a tuba), then the bandoneón slowly came in. The music had been in 2/4 - milonga time signature (aside from the Vals). 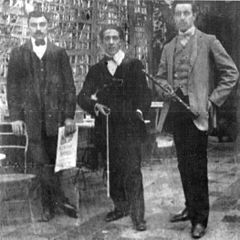 Roberto Firpo is the first person to introduce the piano to tango, as well as multiple orchestrated violins. He has a different concept than anyone before him. And he has discovered a song, in a café in Montevideo, that he really likes and put a lot of creative effort into using it to showcase his fresh and original ideas. The unknown song is called La Cumparsita. He is the first arranger to write note-for-note what each musician (piano, bandoneon, bass, violins) will play on a recording. (No singers for another dozen years). 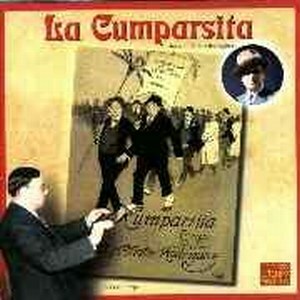 His Cumparsita recording and arrangement become the template for how every musician will play tango from then on. He makes the dynamics swell, die down, finish big - now the tango way. He introduces a counter-melody everybody assumes was part of the original composition. His accents, his rhythm, his voicing of the instruments - all so definitive of what tango should be that it is as if he has received the Ten Commandments and his work is the tablet of a new religion. All tango roads (to mix metaphors) lead to Firpo. A perfect example of the question: is it milonga or tango? 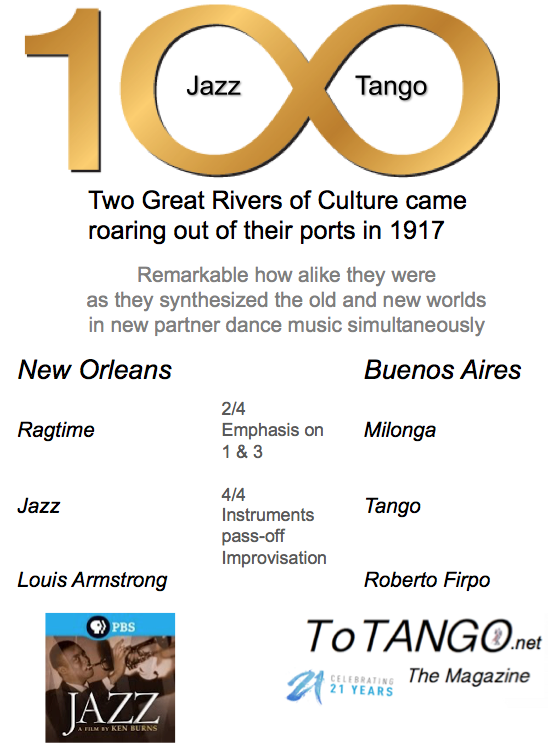 Why they used to call it tango-milonga in the old days on sheet music. I've done everything I can to make the audio sound better, but this is from a time when "acoustic" recordings basically picked up very little. However, ignore that and listen to the ideas and the playing. It really is a window into both the past of tango music AND its future, for with this very recording we truly enter the world's Age of Tango. Firpo's influence is almost beyond description now. 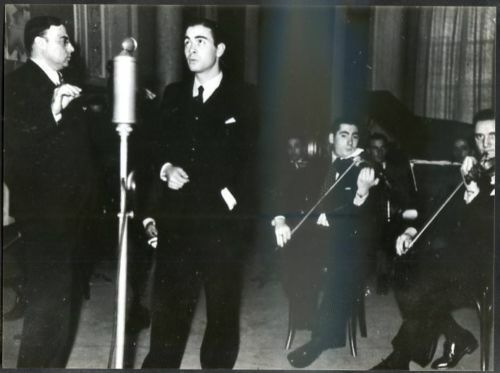 He nurtured the careers of many great future stars; Pedro Maffia to Elvino Vardaro (himself from OTV to Piazzolla), Osvaldo Pugliese and others. 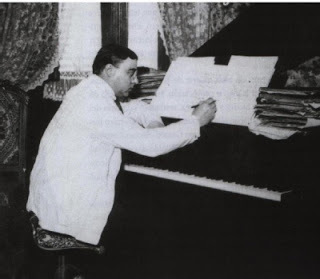 His own compositions have been recorded by orquestas over and over until this day. Why isn't Firpo more generally known as one of the giants? His recordings. The large orquesta releases like the one coming up (not tango-milonga at all) sank beneath the radar over time. In his hey-days he invested heavily in land and businesses which turned downward after a time and left him in a much-diminished financial situation. So he went back to making music; but could no longer (or didn't want to) mount a big orquesta. Hence, all of his modern recordings were with either 4 or 5 players - and that sound basically cannot compete with a lush band sound. But he always maintained a fabulous touch as a musician. If one listens in a certain way, his every recording can be a lesson in how to do it like no one else. 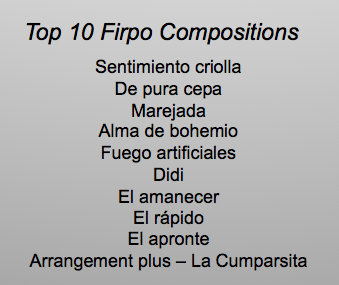 Indeed, Firpo is the only leader who kept the tango-milonga style in his music to the end of his recording days. This makes his small group recordings tricky for a dj to play. His most popularly known recordings are with his later quarteto and they must be carefully chosen so as not to confuse dancers. If you play a tango that feels too much like a milonga, or vice-versa, that uncertainty will pull down the energy of your milonga. The fine line must be understood and not crossed. Again - another good lesson; this time for the well-prepared, experienced dj. Tempted to say: don't ever select Firpo songs on the fly unless one has danced to them at home first to make sure it falls in the intented pocket (thereby avoiding regrets). But the over-lay of rhythms in his music and the challenge therein makes him popular with many advanced dancers. In small doses. Firpo's cuarteto music is still more challenging than anybody else's, really. He wasn't playing around and he didn't want anyone to forget where tango came from. To one who gives much, much is owed. So Firpo as an arranger marked the path for all who have followed. The complexity yet sweetness of his strings harmonies wafting over those funky rhythms in a big, rich orchestral sound is music I always play on big occasions. There is a finesse and vision in his music in those days that says tango tango and inspired the other orquestas in a big way. To this day, in every milonga everywhere in the world, the unwritten Law is: the last song - to signal that the night is at an end and to send everyone home with the best feelings possible - that last song MUST be La Cumparsita. No exceptions anywhere, ever. It is not popularly known that not only is this a tribute to tango's most famous and beloved song and the feelings it evokes, it is an ever-lasting mark of homage and gratitude to the great, great, maestro Roberto Firpo who gave it to us. And who also gave us tango as we know it.